I love this quote from Jack Nicklaus! I was guilty on all counts in 2017 and my below normal tournament scores reflect my lack of attention to detail this year. When I was playing my best golf between the years 2006-2009 I had much better focus on the target and had a positive attitude. This year, I admit I played most of my golf shots with just a "general" target in my mind...not good. I played many rounds with a "down" attitude as well. 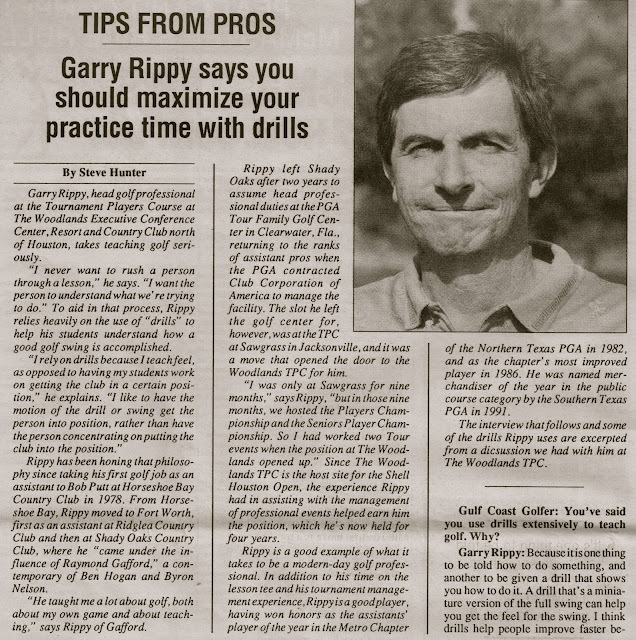 Whether you play tournament golf or not, if you want to improve your scores, you cannot be vague with your intentions. This applies to every shot...period! We all need to do a better job even in our casual rounds of golf with this focus. If you don't practice this process in casual rounds it will not just happen in tournament rounds. You must play from point A to point B within your capabilities. Go back and read my recent post on preparing and playing in tournaments. Even if your "tournament" is just to beat the guys/girls in your foursome, you should take it seriously and give each shot the focus it deserves. This simple Jack Nicklaus quote has given me a renewed interest in competing in 2018. Who is with me?? Congratulations to Eston Duff for winning his age division in the US Kids Tour Championship (Austin). Eston shot a 76 at the Plum Creek Golf Club in Kyle. He has been working hard on his game and is looking forward to competing in 2018. Congratulations goes to Zach Slayton for his second win of the year on the Texas Junior Golf Tour! Zach came from 4 shots back to win by 7 in the Wolfdancer Winter Classic hosted at the Hyatt Wolfdancer Golf Club at Lost Pines near Austin, TX. In January of this year Zach won the Onion Creek Classic in Austin. 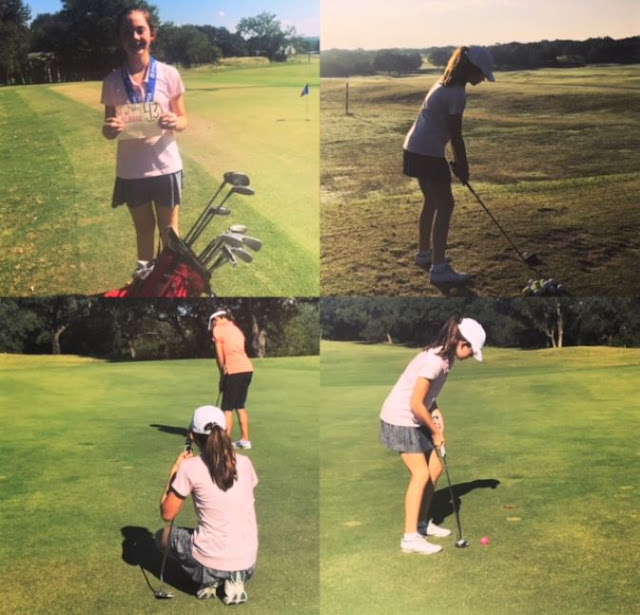 Zach also won the prestigious Starburst Classic earlier in the summer in Waco, TX, and has done well competing on the AJGA Tour and the STPGA Prestige Tour. Following are two guidelines I provide to all of my up and coming junior players that want to start competing. But, the guides can be used by any golfer whether they want to compete or just be the best player they can be. The guides are simple and will help you understand your current ability and the steps needed to get to the next level. 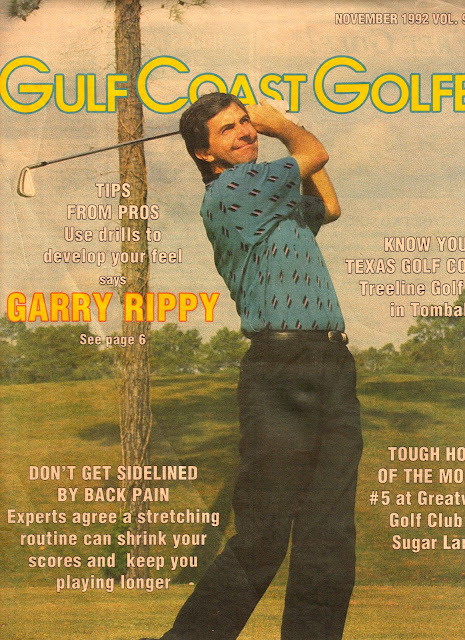 The first guide is "Manage your Game" and the second guide is "Tournament Golf". Managing your game includes managing the physical as well as the mental. The number one rule is to stay in the present during your round. You cannot predict what you are going to shoot. You are setting yourself up for disappointment if you do. 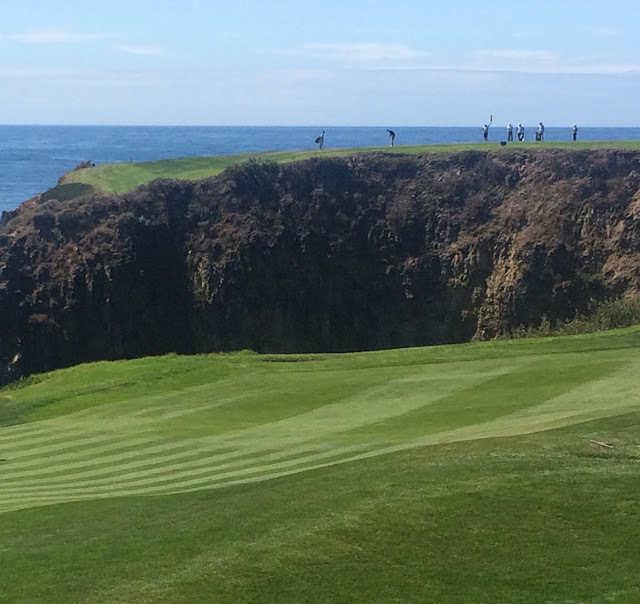 Just because you are getting ready to play a short or easy hole does not guarantee a birdie. If you are not careful, you can walk away with a double bogey. Before you learn to manage your game, you have to know where you are starting. It is a journey. Once you evaluate, you will have a better understanding of the physical and mental work needed. I will say that playing the same course every day can make us complacent in game management. We put our brain in auto pilot and go through the motions. You may not know yardages but you know you hit an 8 iron when you are by this tree on #1. When you take your game on the road, you may not play as well because you have lost the ability to go through the process of hitting a shot. Lack of attention to detail leads to inconsistency. Your answers to these questions will help you better understand which parts of your game need improvement so you can meet your goals. b) Improve Mechanics and Physical Conditioning. An example of improving mechanics would be making a set-up or swing change to improve ball striking, add length and consistency. Try to keep swing thoughts few and simple. Learning to hit shots left, right, high and low would be another example of improving the physical. These are the shots that get you out of trouble. Part of managing your game is knowing how far each club goes in the air (see Set Make Up below). Working on short game mechanics is very important and will give you the fastest improvement to lower your scores. Learn to be more creative around the greens ie. know when and how to hit a short shot high or low. Also part of physical management is your actual physical conditioning. Fitness now plays a huge role in TOUR players and should play a role in your game as well. It should include core workouts and walking. Stamina is very important especially toward the end of the round. If you are getting physically tired, you will not perform as well. You have to play all 18 holes and all are equally important. Drink plenty of water during the round, not soft drinks or alcohol. Visit www.golfclubspec.com to find the specs of your set. The list for mental improvement is much longer than physical! One of the best pieces of advice I have heard is "make an aggressive swing to a conservative target". Instead of hitting an easy driver, go ahead and make an aggressive swing with the club that will not reach trouble. When we are not committed to the shot we usually make bad swings. Always hit the shot you know you can hit. Always pick a target for every shot. It is OK to acknowledge the hazards, then focus on your target. For short game shots, your target is the spot you want the ball to land. Your pre-shot routine is important. This should be in process while the others in your group are playing their shots. 1. Choose club, based on yardage, wind, uphill/downhill (Masters Champion, Jackie Burke- "we didn't have yardage markers or yardage books, we figured out which club we could hit over the green and then hit one less"). 2. 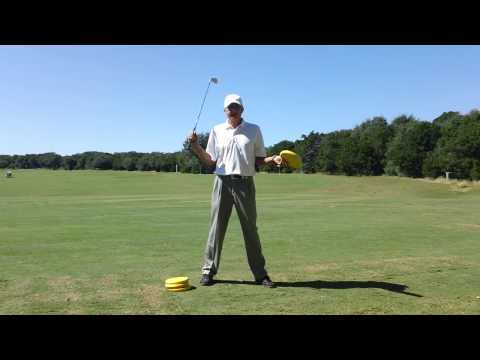 Pick target and intermediate target-this is done from behind the ball and will help you with alignment. You should play the course based on your current ability. Again, you have to hit the shot you know you can hit. To me, course management is connecting the dots on every hole. You play from point A to point B, go through your routine and then add the score when you are finished. As an example, if you are playing a long par 5, divide the hole into thirds. Let's say the hole is 540 yards long. If you divide into thirds, you only have to hit each shot 180 yards. Now, if you hit your drive 220 right in the middle, you only have 320 yards to go. At this point you can divide that in half and play it as a short par 4 by hitting two 160 yard shots or hit your second shot 180 leaving only 140 to the green. You get my point. If you hit your driver 275 yards but out of play, now you are looking at bogey or worse. 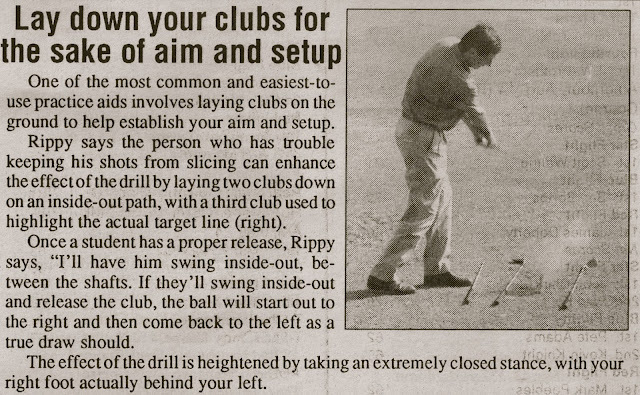 I use this same technique on par 4's. Only I divide the yardage in half. I usually look at the yardage and then figure "how far do I have to the 150 marker?" The bottom line is what did you shoot, not how you did it. That's why the box is so small on the scorecard. Depending on your ability and weather conditions, you may play this par 4 cautiously by laying up both the tee shot and second shot OR go ahead play it as normal. The beauty of golf is there is only "your" way of playing the hole. Remember: loft is your friend- loft keeps the ball in play. How do you practice course management? 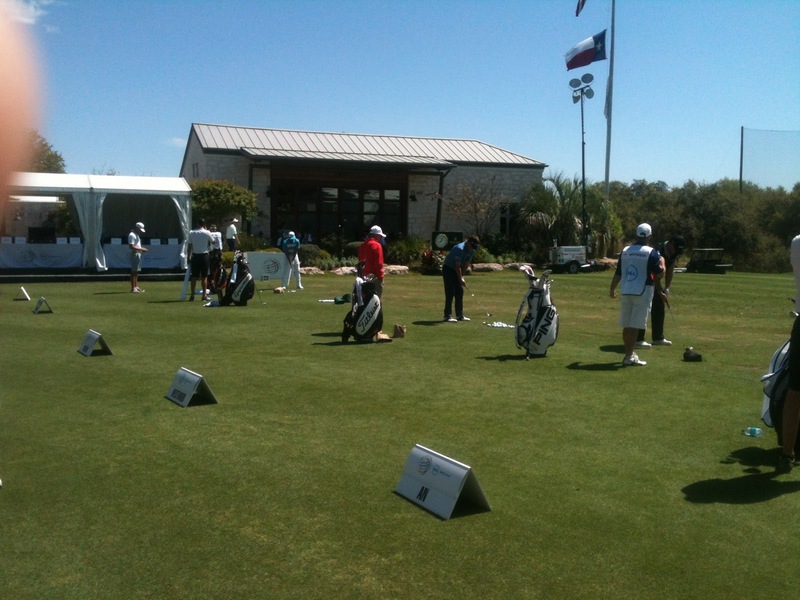 On the practice tee, go through your routine on each shot you hit. It is your quality of practice and not necessarily your quantity that will help you improve. Visualize playing a golf hole on the range. Don't just go bang 150 seven iron shots. Hit a drive, based on how you hit it, choose the club you need for a second shot and hit that. This will help your visualization skills. Don't let them ruin your game. It is just a game. Suffer in silence and enjoy in solitude. Each shot deserves to be hit with the same focus and attention. Don't follow a bad shot with another bad shot. Breathe, keep your head up. Play with Focus, Play Fast, Play Fair and you will play Fantastic and have more Fun! 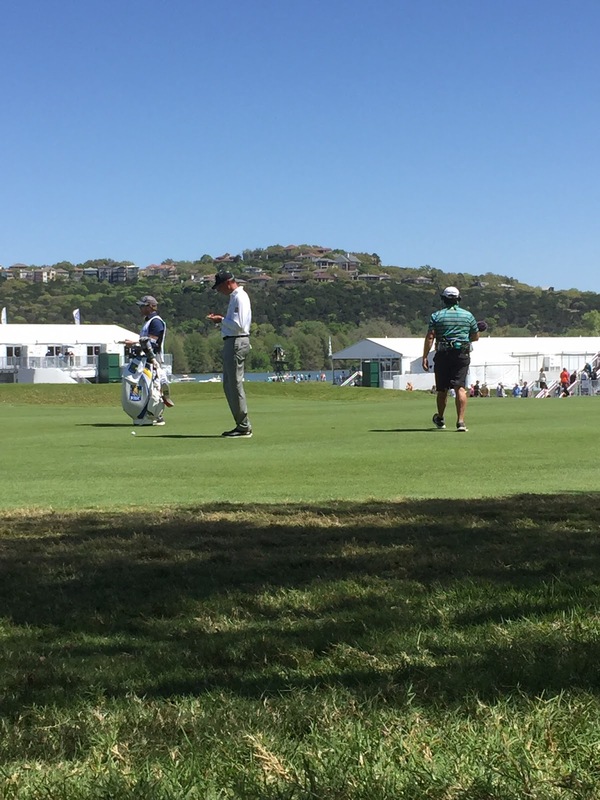 The difference in social golf and tournament golf analogy: Social golf is like walking on a 15’ long 2x4 on the ground. As the competition expands, raise the 2x4 two feet off the ground for each level you grow (club, city, state, national). Raising the board increases your intensity level! It's the same 2x4 so you have to embrace the challenge and walk that 2x4 with confidence at each level. Remember: Half the field does not care what you shoot and the other half wishes you would have scored worse! Play your own game! From 30,000’ in the air looking down you are just a speck on the course…golf is not that big of a deal in the grand scheme. Just go PLAY golf and add up your score at the end. It is the little things that will make you better. Have a good grip and set up. Then line up properly and go from point A to point B! Play with better players and you will improve and learn what they do well. 1. Love every club in your bag! 2. Identify areas of concern and address them. 3. Instruction: don’t wait until the week before and decide you need to fix your swing. 4. Get in shape: exercise to improve strength, flexibility and mental toughness. 5. Know the basic rules of golf for your benefit and to protect the field. 6. Foul weather gear: have a great waterproof rain suit, sunscreen, umbrella, towel, band aids, insect spray, etc. 7. Develop practice schedule: treat like a job to get prepared, and make time for long game and short game. 8. Putt everyday: work on 3-5’ putts and 30-50’ putts. 9. You will score lower with a great short game. Practice chipping, pitching and bunkers. Learn to be creative when needed. 10. Narrow focus when practicing: use one side of the range and work on alignment. 11. Practice course management: easy to get lazy when you play the same course daily. 12. Develop a pre-shot routine to improve consistency and better prepare you to hit a shot. It never varies regardless of the situation. 13. Practice round for event: DO NOT KEEP SCORE! You are there to learn the nuances of the course. 14. Night before the event: visualize each hole in your mind and how you are going to play the hole. 15. If a large event with a starter, gallery etc: start practicing the first tee shot a week in advance. When on the range imagine the starter calling your name and then visualize the shot and hit it. 16. Prepare clothes/snacks/directions etc. the night before the event. 1. Give yourself plenty of drive time. Don’t arrive rushed. 2. Walking/Riding? If riding in a cart, try to drive so you are in control. 3. Stay hydrated/carry snacks, no soft drinks or candy. 4. Putt first then hit balls before the round. The putting green is usually empty at first so you can find a short putt and make 25-50 putts. Then put some long putts to get the feel of the greens for the day. They may be faster for tournament day. 5. Warm up: feel tempo, not mechanics. Hit enough balls to feel tempo then hit a few bunker shots and pitch shots. Do not wear yourself out! 6. Arrive to the tee early. Read the rules sheet. Don’t forget the hole location sheet! 7. Attitude: be the player you would like to play with. Maintain even keel with emotions. 8. Play your game, not your fellow competitors. 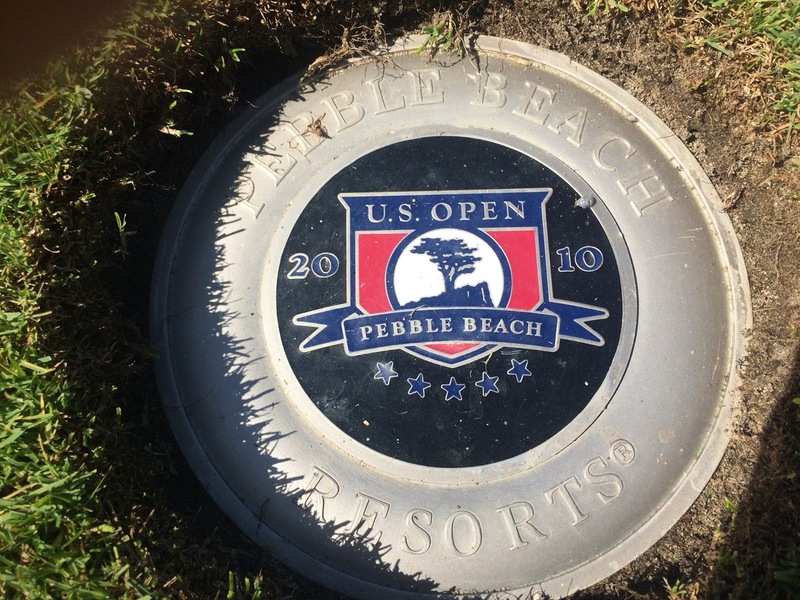 If you planned on laying up on a hole and he/she hits driver…who cares. 9. BREATHE and keep your head up. Remember animals in the jungle that keep their heads down get eaten! 10. Course management: Remember 6 is better than 7. Don’t follow a bad shot with an equally bad shot or bad decision. 11. See positive, not negative on each hole. Remember, acknowledge the trouble then play from point A to B. 12. Stay in the present: don’t fall into the trap of looking ahead to the easy 15th hole thinking you will make birdie. 13. Play every shot as if it's your first shot of the day...there is no history on the first shot. 14. Be prepared to play when it is your turn. Don’t start taking more time just because it is a tournament. 15. Double check your scorecard and sign it. Thank the volunteers for their time. 16. If it is a multi-day event, go work on any issues at the range, but do not wear yourself out. 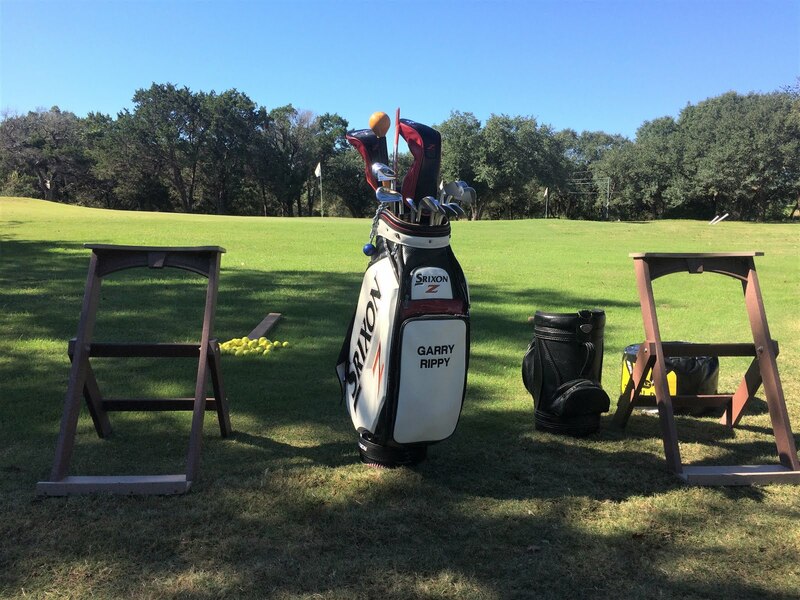 Keep stats, learn from them, and then go play golf…not golf swing! Congratulations to Mabrie for Winning! Congratulations to Mabrie McMahan for winning the STPGA Little Linksters Girls (age 11-12) Division at Rebecca Creek GC (10/8/17). Mabrie has a great attitude, works hard and is determined to get better! Way to go!! A Great Week in Pebble Beach! 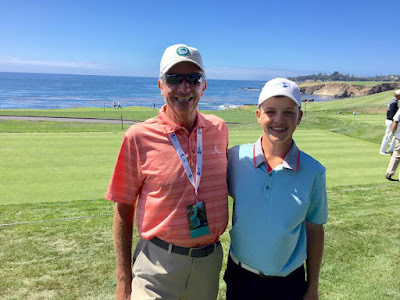 I have many junior golfers I get the opportunity to work with and in this instance, one of my juniors, Zach Slayton, competed on a national stage. 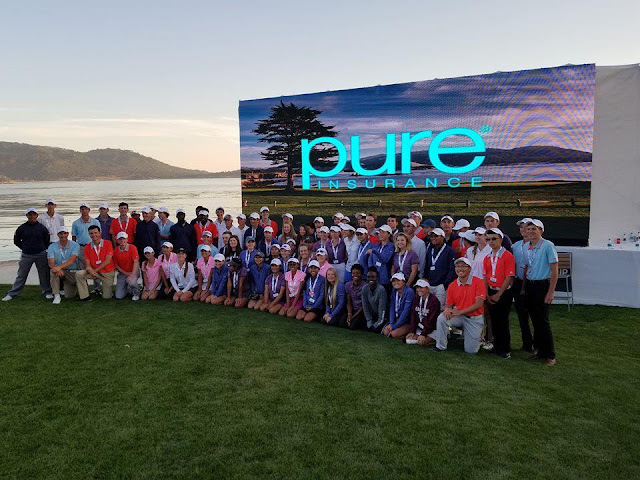 Zach was one of 81 junior golfers from around the country invited to compete in the 2017 Pure Insurance Champions TOUR event in Pebble Beach, CA. The format of the event paired a Champions TOUR player with one junior and two adult amateurs for three days. 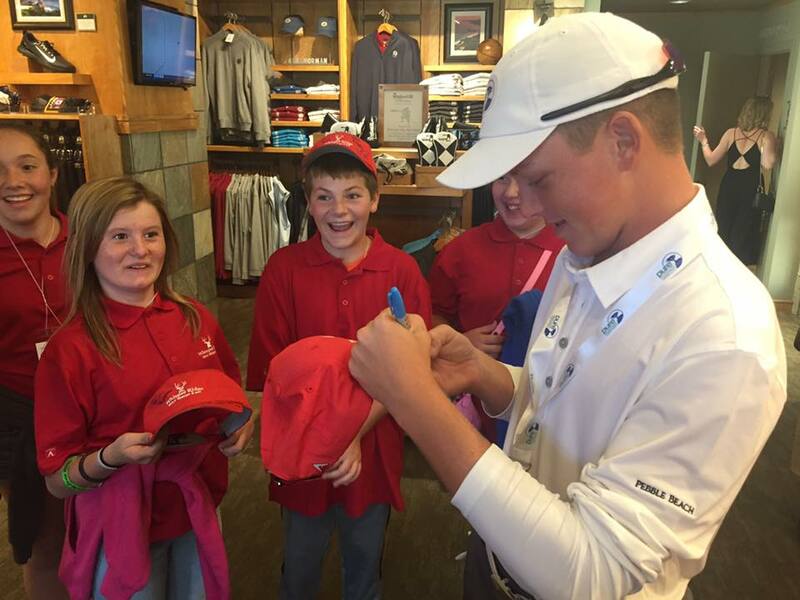 The juniors remained with their TOUR player for the three days and the amateurs rotated pros. 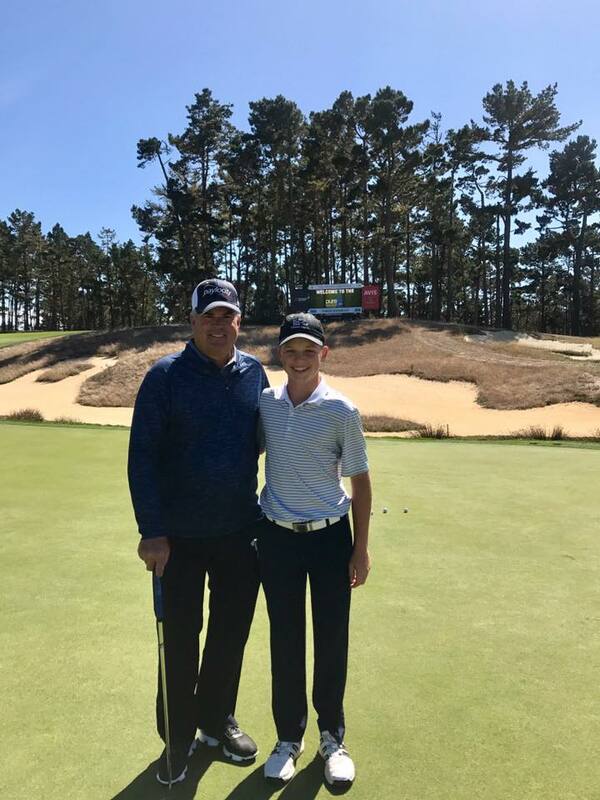 In his first practice round at Poppy Hills, Zach played a few holes with Champions TOUR player, Kenny Perry. 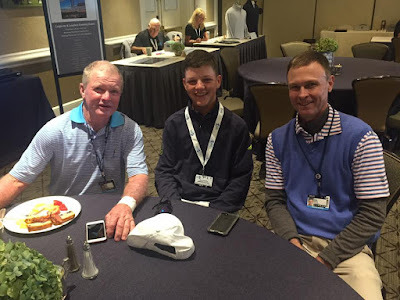 And breakfast with Champions TOUR players Tom Kite (1992 US Open Winner at Pebble Beach) and Bob Estes, both from Austin, TX. In the tournament proper, Zach was paired with TOUR veteran Scott Dunlap and he could not have been nicer to Zach. Individually, Scott finished in a tie for 15th place with a score of six under par. There was a cut not only the pro division after two rounds, but for the pro/junior division as well. If Zach wanted to compete in Sunday's final round, he and Scott would have to be in the top 23 teams. I was fortunate to attend the event and support Zach in any way possible. 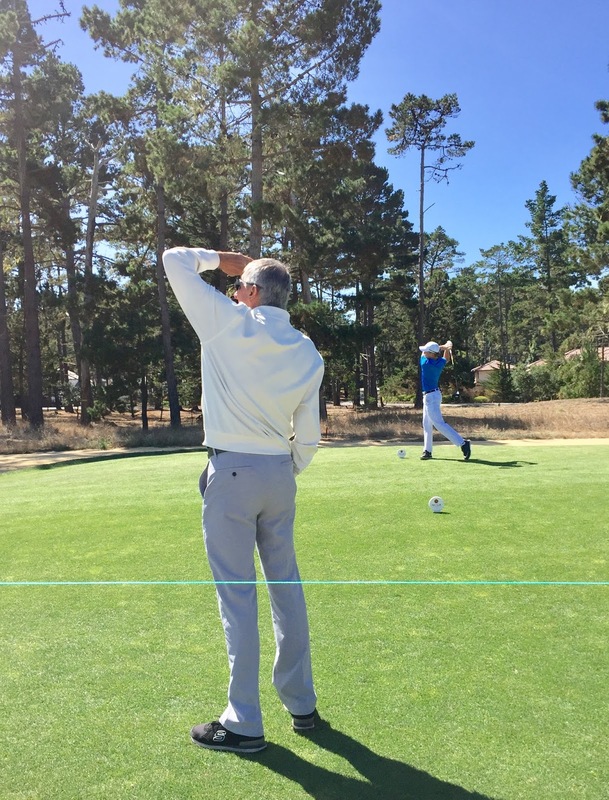 I arrived on Thursday and watched him play the back nine at Poppy Hills in a practice round. Poppy Hills is a beautiful course and much different than Pebble Beach. It is located well above the Pacific Ocean and is tree lined with many bunkers and waste areas. After he finished the round, we went to Pebble for some fine tuning before the first round which started Friday. The work he has put in over the last year paid off in a big way in the first round. 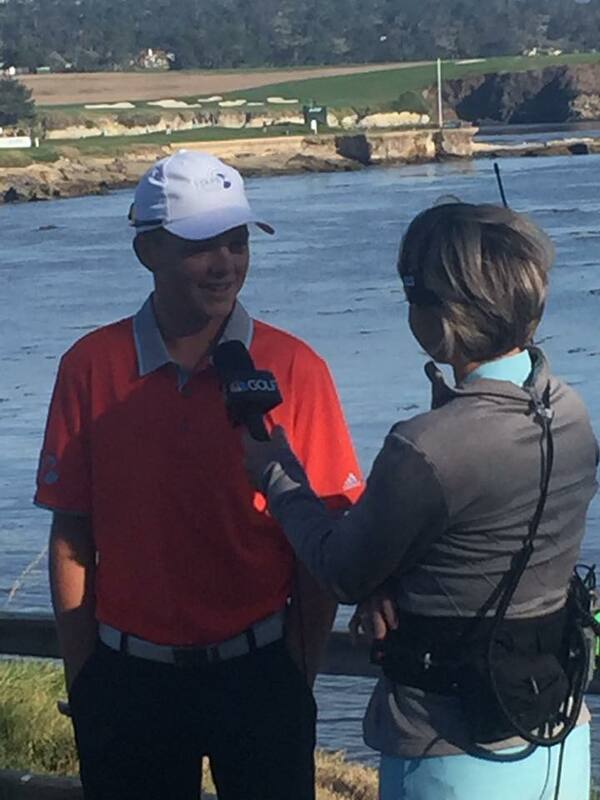 Zach shot his lowest tournament round of the year, shooting a two under par 70, at Pebble Beach! I was very proud of the way he handled himself in this large environment. 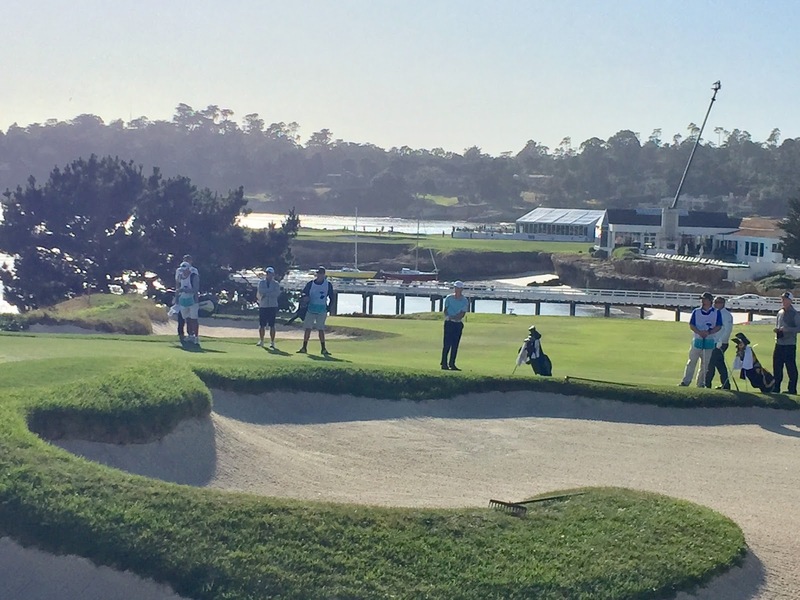 In the second round at Poppy Hills, Zach's good play continued and he shot an even par 71. Needless to say, he and Scott easily made the cut as they were tied for 9th going into the final round! The stage just got bigger as they were in the top ten teams and would more than likely receive more TV attention on the Golf Channel. When it was all said and done, Zach and Scott finished in a tie for ninth place at fifteen under par! As predicted, there was some TV time for Zach, especially when he chipped in for a birdie on the 15th hole at Pebble Beach! And again when he was interviewed near the 18th green after he completed the round. I have a feeling Zach will be signing more autographs in the future. What a week to remember for Zach, his parents and of course me too! I was impressed with all the juniors which competed this week. I witnessed some great golf, but I was really pleased with all the positive attitudes, smiles and professionalism of each junior golfer! Golf is in great hands for the future. Following are some pictures which I took at Pebble Beach. This truly is golf heaven! 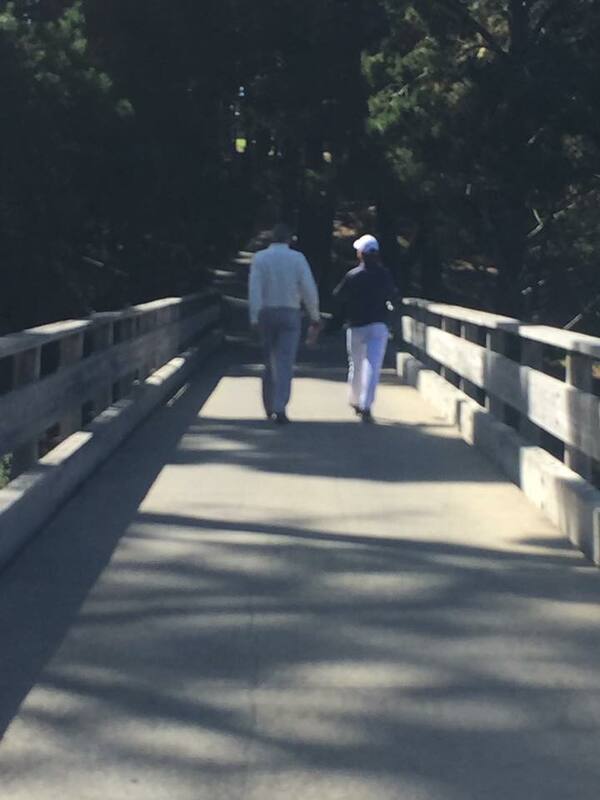 Just a picture from Monterey Bay Country Club which is on 17 mile drive. This is one of the prettiest par 3's I have seen. We are a product of our teaching is all I can say about this photo. I found some pictures from my high school yearbook (circa 1973) and compared them to some current pictures of my swing. In the early 1970's the golf swing concept was to "keep your head behind the ball" long into the follow through. This is commonly called a "reverse C" finish. Well I certainly listened and perfected this concept. It did however require a limber and young back to accomplish. 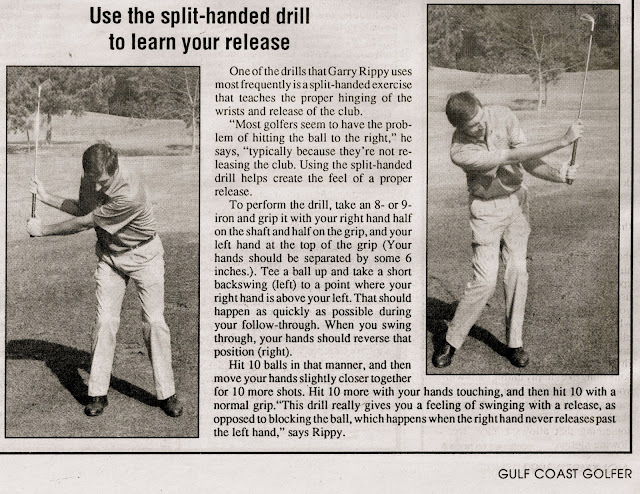 It also required excellent timing to release the club with the hands. Release too early and you hooked the ball...too late and you hit it to right field. In the 2017 version, note how much taller I finish, my shoulders are very level and the club is more around the body and level to the ground. This swing is much easier on the back and requires less timing of the smaller muscles. This is definitely more of a body release swing and not a hands release. It is much easier to get your weight to the front leg which leads to more consistency. 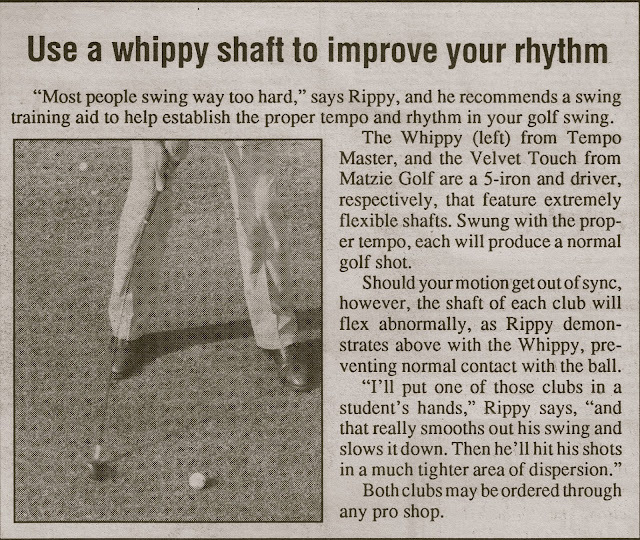 I went back in the archives and found some classic reverse C finish golf swings. The most common trait of this reverse C finish is the belt buckle is closer to the target than the head. The left knee also tended to have a little bend in it at the finish. If my memory serves me, this swing was definitely taught through most of the 1970's. What I have observed however is players from the 1950's and 1960's had more of a traditional or classic finish even into the 1970's. They didn't buy in to the new finish position. Here is a photo of some classic finishes. In all of these swings, the left knee is taller or more "posted" than the reverse C finishers. The spine is much taller with the head located more on top of the torso. 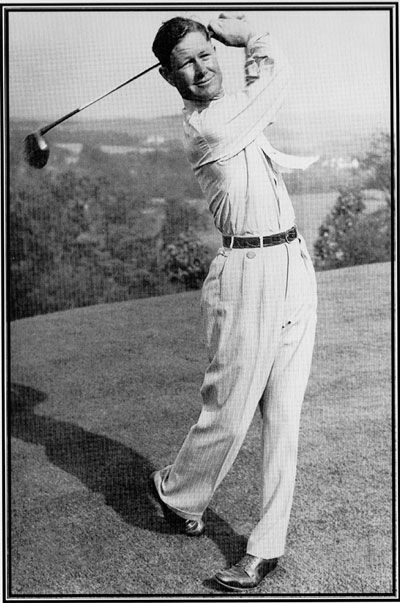 Sam Snead had this classic finish throughout his career along with Ben Hogan and Byron Nelson just to name a couple. So how did we decide the reverse C was the new way to finish? 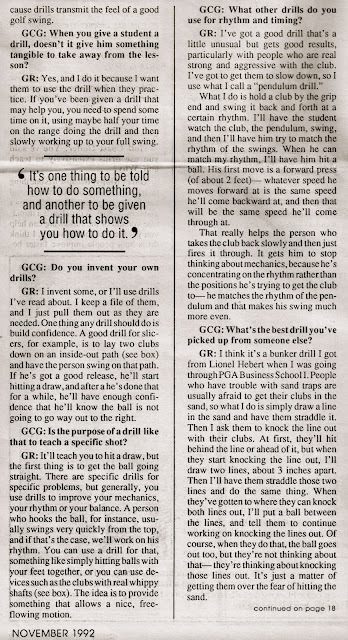 That is a great question and I would say it was developed as a way to hit the ball higher with more carry. I will say I played some decent golf with that finish as did the players which utilized the concept. But the older players maintained their classic finishes and did quite well too. Somewhere in the early 1980's the reverse C finish went away with the exception of a handful of players. Mike "Radar" Reed maintained that finish throughout the 80's and Jeff Maggert a player from the 1990's (current Champions TOUR member) still has a bit of the reverse C in his finish. I prefer the classic finish as it will lead you to more longevity in the game. The modern equipment is designed to hit the ball higher so there is really no reason to stay behind the ball so long anymore. Just a side note...I am not saying I want you sliding your head past the ball on the down swing. The lower body still has to start the down swing with a slight shift of weight to the front leg and then hip rotation to the target. Follow the links below to some drills which will help you finish like a pro. Another Playoff Win for Zach Slayton! Zach Slayton wins in a playoff to secure his second victory this summer at the STPGA Prestige Tour event held at The Hills of Lakeway in Austin, TX. Zach also won a three man playoff at the Starburst event in Waco, TX, earlier this summer and he won a playoff to secure a place in the AJGA event at the TPC San Antonio a couple of weeks ago.